There have been plenty of memories both on and off the ice for Trevor Zegras as a member of USA Hockey’s National Team Development Program. One special moment came Oct. 19 when he got the chance to play on his future home ice against Boston University at Agganis Arena. “I have wanted to go to BU and play college hockey there for as long as I can remember,” Zegras, who picked up three assists in the game, said. “To be able to go play there, even as a visitor, it got me very excited for my future. I cannot wait to go there next year. With his aforementioned long-standing goal to become a Terrier, it became an easy decision for Zegras to commit to BU. “They have a great program and coaching staff,” Zegras said. 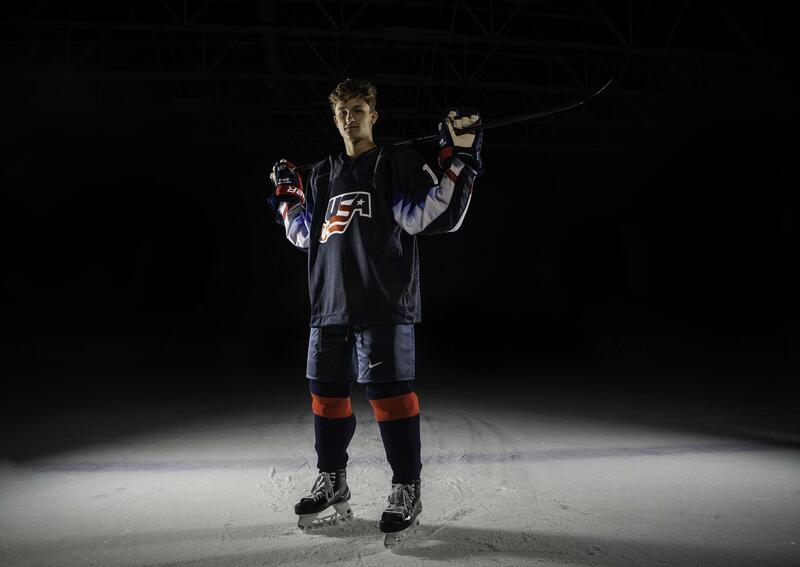 “I already know [former NTDP players] Joel Farabee and Jake Wise, who are there right now. Plus, a few of my current teammates will be heading there next year so we will already have that connection. “It was always a goal of mine to play in Boston. I knew a little about the BU program as I have skated with Patrick Harper and [former NTDP player] Chad Krys in the summer." In addition, Zegras appreciates the head start he will have when he heads to BU next fall as he had already faced collegiate opponents. The 6-foot, 169-pound forward has already noticed a big difference on the ice this season as a member of the Under-18 team from his first season with the red, white and blue. “My confidence — I am playing with more confidence on the ice and I have the puck on my stick more," Zegras said. "I have good teammates and that really helps with my level of comfort." Over the course of the past five games, Zegras has tallied six assists, but deflected the credit to his teammates for putting the puck in the net. Playing in the Quebec Pee Wee tournament was the most memorable and making the USA Nationals my Bantam Major year with Mid Fairfield. Which celebrity would you carpool karaoke with? In addition, the Bedford, New York, native realizes he is playing with a very special group of players on the ice. “We have just about every role possible on this hockey team," Zegras said. "It’s a special group. We have guys who can skate and others who can play the game a different way. I believe our defensive core is one of the best. We have great goaltending. Zegras also takes to heart some advice from U18 head coach John Wroblewski. 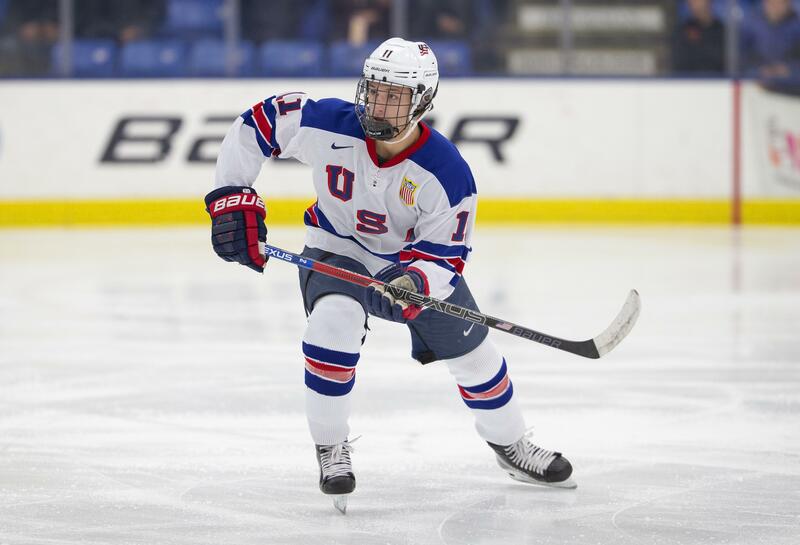 The advice came in handy at the 2018 USA Hockey All-American Prospects Game in St. Paul, Minnesota, when Zegras tallied the game-winning goal for Team Jamie Langenbrunner in a 6-4 win. It’s a special group. We have guys who can skate and others who can play the game a different way. At this point, Zegras is focused on a strong finish to his season. He and his U18 teammates will head to the Under-18 Five Nations Tournament from Feb. 3-10 in Sochi, Russia. There is something about international competition that Zegras and his teammates thrive on. The group has won their first four tournaments they've been a part of, including the Five Nations in the Czech Republic in November 2018. At the end of the day, one memory will remain for Zegras and that is just how special it's been to wear the USA jersey every day.